Today at the Google I/O developer conference, the company has finally found a way to make its mobile office solution much more sensible. The several pieces of the Office that were once announced now finally make it something to be worthy of use. With the integration of QuickOffice and Sheets, Google has reached to the point when it can directly compete Microsoft Office. The productivity suite it creates and its benefits to the average consumer and a legitimate competitor to Microsoft’s Office suite on mobile. 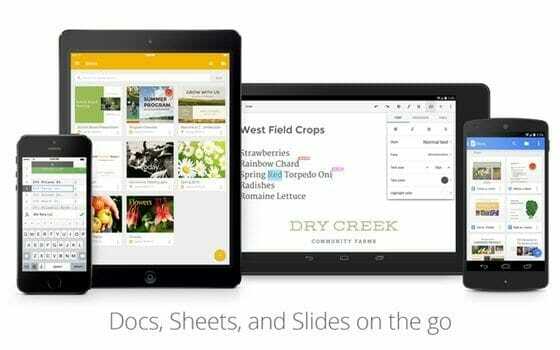 Starting off with the Google’s presentation software, Slides, is now available on mobile. From today it will be available on both Android and iOS (once it receives approval of the App Store). Like Docs and Sheets, it’s an impartial app that sits apart from Google Drive. Google Drive is mostly focused for storage. Though all Three apps and the QuickOffice are still tightly integrated. Google has finally reached to the point where those apps can separately handle Microsoft Word (the one I’m using), Excel (never opened it) and PowerPoint (my presentation companion) files natively without conversion. The company has simplified and streamlined its office suite. Ryan Tabone, director of product management says that breaking the apps into distinct and immediately obvious icons makes sense. The apps being Google Docs, Sheets, Slides and QuickOffice. Says Tabone. The QuickOffice brand will be folded into the three core apps. These apps, as mentioned earlier, are finally able to directly edit Microsoft Office docs without requiring conversion. Apart from the integration stuff, users will be able to save them directly or store then in Google Drive. The other strategy of Google is to extent its lead on the one feature it innovated in productivity apps i.e. real-time collaboration editing. With the addition of this feature to Google Docs, it makes it easier for multiple people to edit the same document. Instead of merely just commenting what to do, multiple people can simply change its direction and the document will use Google Docs’ comment system to track the changes. It’s actually not that different from Microsoft Word’s “Track changes” feature. But it feels more immediate and more intuitive. Says Tabone. With the QuickOffice and the three other apps combined, this can be great start to a new beginning for Google initiative for an integrated and on touch environment. Stay in tuned for the latest action at the Google I/O developer conference.